Urban Search and Rescue (USaR) teams face difficult working conditions and harsh environments. The INACHUS project seeks to increase the overall efficiency of USaR operations by minimising the amount of time needed to locate victims, while also aiding rescuers to find the safest and most effective way to recover those victims. 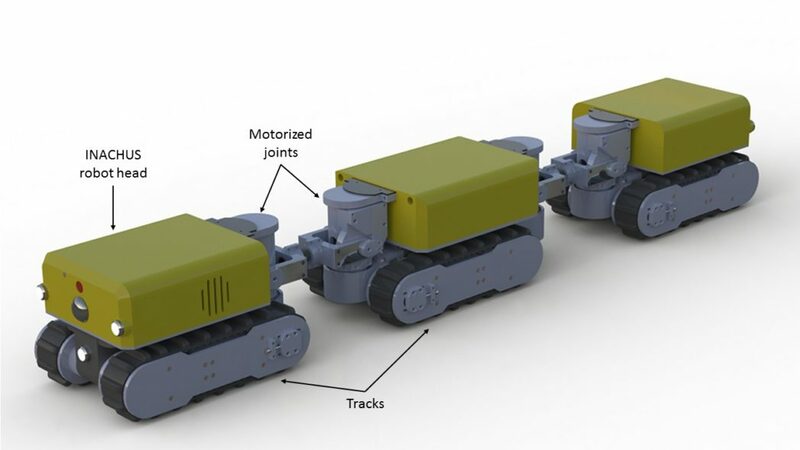 SINTEFs main task is to design, develop and build a snake-like robot prototype able to assist the USaR teams. 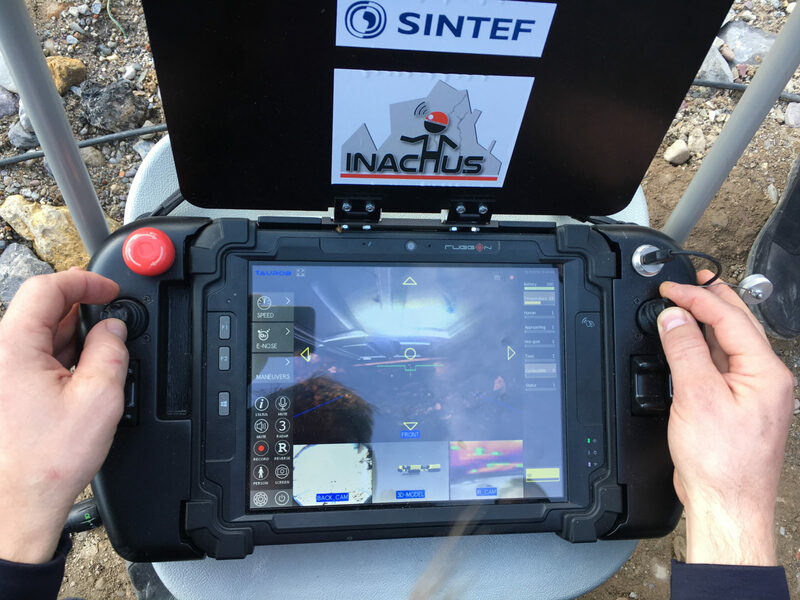 This prototype integrates several sensors, some delivered by other partners in the INACHUS consortium and it complies to the defined end users (USaR teams) requirements. The INACHUS robot is a snake-like robot prototype designed and manufactured by SINTEF. The main goal is to help USaR teams finding and communicating with victims under a collapsed building. Final design of the INACHUS robot. The robot is remotely controlled by a rugged tablet PC as shown in the picture below. 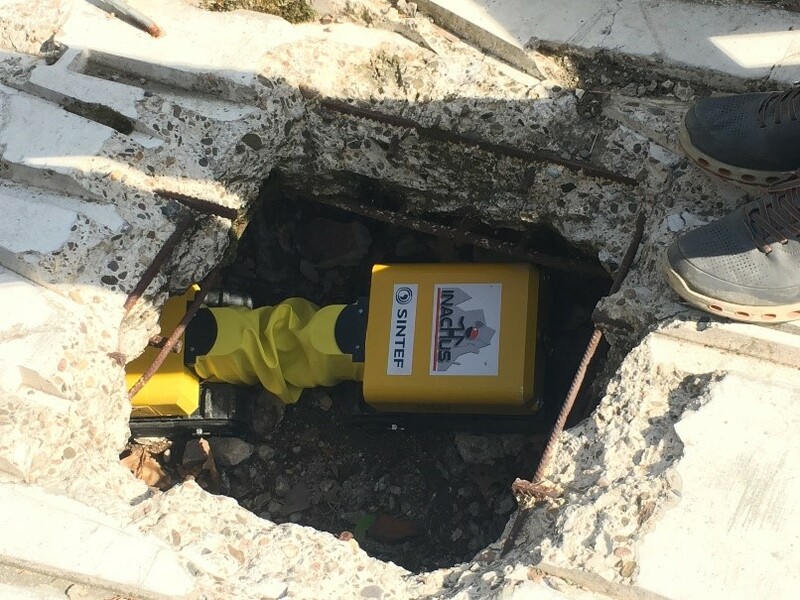 An operator can drive the robot under the rubble by entering through small holes of about 20cm x 20cm of cross-section. The INACHUS robot integrates the following components positioned as shown in the image below. Two video cameras assisted by powerful lights assisting the end users to get a clear view of the unattainable parts of the rubble. An infrared camera to detect possible living victims. An electronic chemical nose to measure specific gases indicating the presence of a living human. 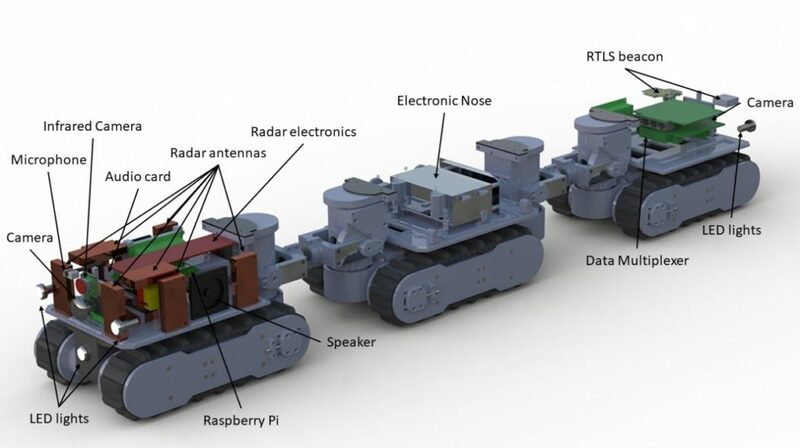 A robot radar to detect slight movements such as the breathing motion of trapped victims. A two-way audio communication system to allow end users to communicate with the victim and collect information. Internal position of the INACHUS robot sensors and communication components. The output of these sensors is visible in the integrated graphical user interface (GUI) running on the TAUROB rugged tablet PC. Integrated Graphical User Interface (GUI) further developed by SINTEF in collaboration with TAUROB. In addition, the INACHUS robot prototype comes with a standard aluminium case containing the power supply, an industrial grade PC and the necessary communication devices. The robot is tethered to the aluminium case via power and communication cables while the TAUROB PC Tabled is connected wirelessly. In April 2018 the INACHUS partners and many end users met in Germany at the Training Base Weeze to test in a relevant environment several INACHUS developments. 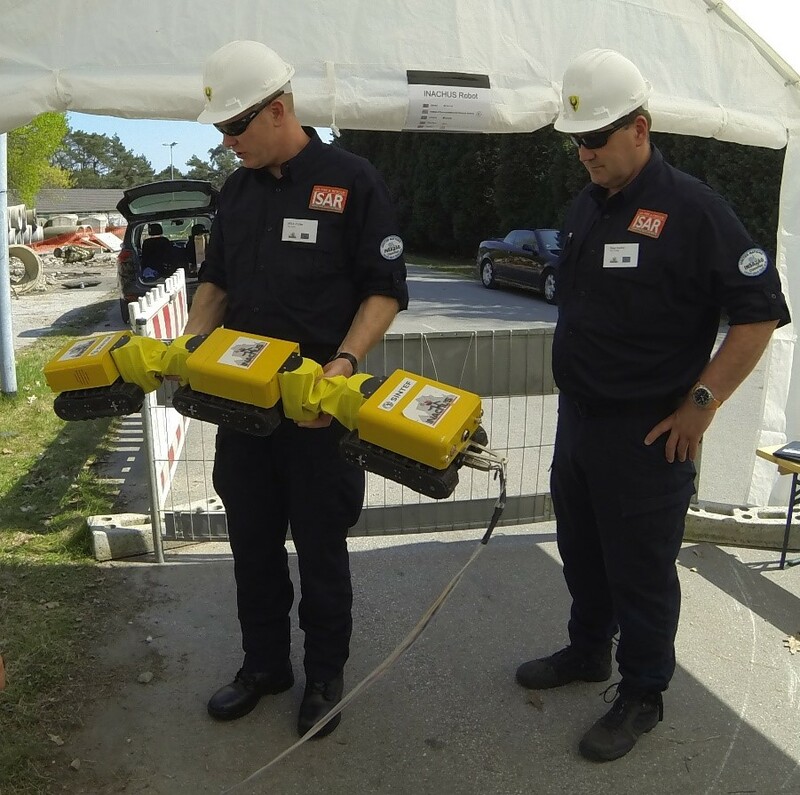 About twenty end users from different countries met the INACHUS robot and for the first time tried it in a relevant scenario for USaR. The picture below illustrates the robot prototype entering a small hole under a heavy and reinforced piece of concrete. This can be the case when a rescue dog has marked human presence near an entrance hole, but unfortunately it is difficult and time consuming to search, locate and assess the condition of a possible victim. The INACHUS robot and its sensors can be used then. It is important to mention that the operator can guide the robot at a safe distance, thanks to the wireless connection from the TAUROB Tabled PC. The video below illustrates the first movements of the robot in realistic scenarios during Pilot 3. 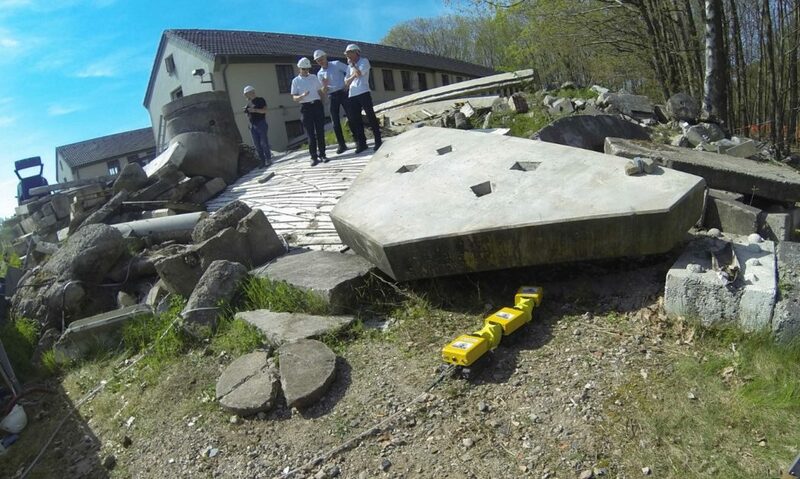 The video below illustrates the “first steps” of the INACHUS robot head in the early demonstration in Sweden during the Pilot 1, June 2016. This was an important moment of the project where the end users gave their feedback and first impressions, even if the prototype was on a very early development stage. The video below illustrates some of the INACHUS robot movement capabilities just before the Pilot in Germany, March 2018. Finally, the video below illustrates the INACHUS robot final test during Pilot 4 in Roquebillière, France, November 2018. 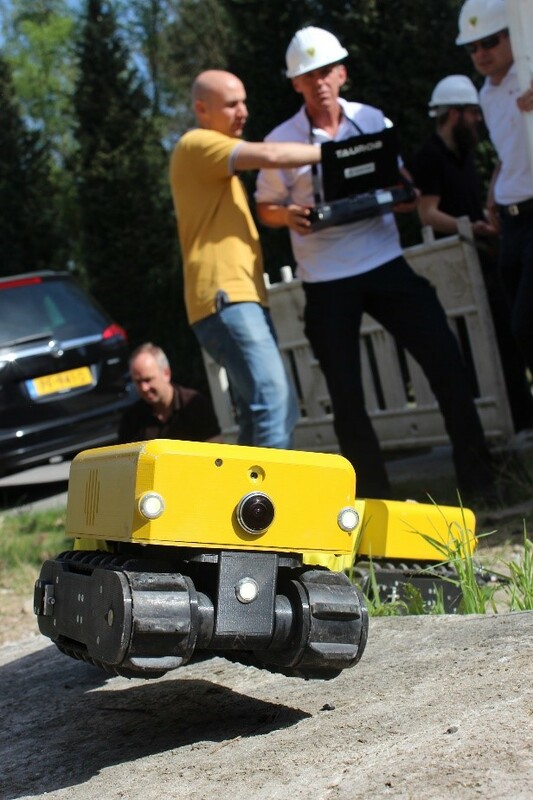 The robot and its sensors were fully integrated in the INACHUS platform. This project has received funding from the European Union’s Seventh Framework Programme for research, technological development and demonstration under grant agreement no. 607522.